The following procedures can be used to assess potential yield in corn. 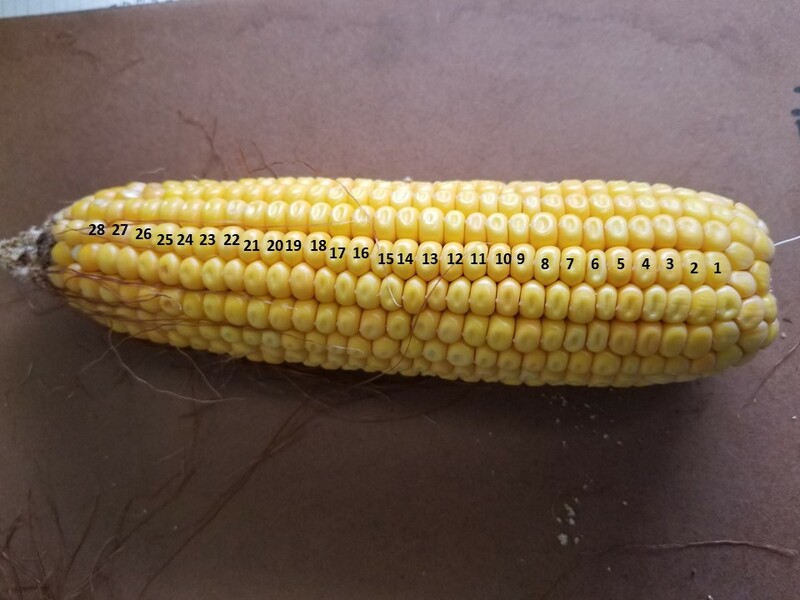 This assessment is best done at or near dent stage so that you can identify the kernels at the tip of the cob that will fill and reach maturity. Mark off a section of row representing 1/1000th of an acre. Table 1 shows the row length required to do this at different row spacing. Count the number of plants with productive ears in this area. Step 2: Determine the number of kernels on each ear. Select ears from five consecutive plants at five different locations in the field. For each ear, count the number of rows around the ear (Figure 1). Select one or two rows of kernels and count the number of kernels from the base to the tip of the ear. Do not count the first kernels at the base of the ear or very small kernels at the ear tip. Multiply the number of rows on the ear by the kernels per row to determine kernel number per ear. Average the kernel number per ear across all twenty-five ears selected from the field. Figure 1. Ear cross section showing counts of rows around the ear. Figure 2. Corn ear with kernels counted on the row. 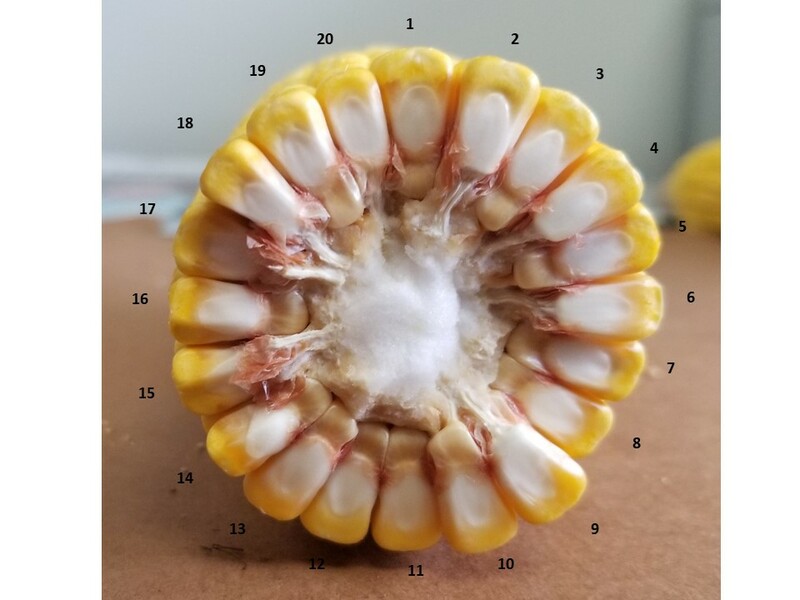 The denominator (90) represents the average number of dry kernels in a bushel of corn and takes into account the fact that you have measured 1/1000th of an acre. If the kernels are bigger than normal then you could consider dividing by 85 or if the kernels are smaller than normal you could divide by 105. (33 X 20 X 28) / 90 = 205.3 BUSHELS PER ACRE!! Table 1. Row length needed to measure 1/1000th of an acre for determining plant populations at different row spacing. • Harvesting Corn: What Grain Moisture Should I Harvest Corn At? • Are You Craving Corn?